For at least the first two decades of MRI, time-of-flight (TOF) MRA was the dominant non-contrast bright-blood method for imaging the human vascular system. Although now supplanted in body MR imaging by other techniques, it still remains one of the most important methods for noncontrast neurovascular and peripheral MRA. As the name implies TOF MRA is based the principle of flow-related enhancement, a time-of-flight flow phenomenon discussed in a prior Q&A. Stationary tissues in an imaged volume become magnetically saturated by multiple repetitive RF-pulses that drive down their steady-state magnetization levels. "Fresh" blood flowing into the imaged volume has not experienced these pulses and thus has a high initial magnetization. The signal from inflowing blood thus appears paradoxically bright compared to background tissue. A maximum intensity projection (MIP) rendering technique with leveling, filtering, and optional surface display is then used to create the MR angiogram. 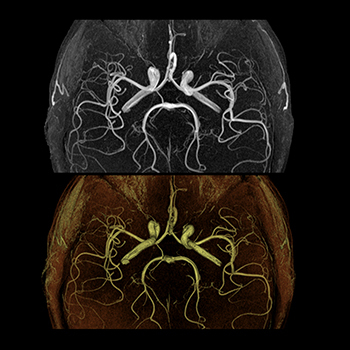 Cranial time-of-flight (TOF) MR angiogram performed at 3T using maximum intensity (MIP) and shaded surface display (SSD). TOF MRA is based on flow-related enhancement, which occurs when fully magnetized blood flows into a slab of magnetically saturated tissue whose signal has been suppressed by repetitive RF-pulses. The TOF angiography method is based around a conventional 2D or 3D gradient echo (GRE) sequence with optional gradient-moment nulling. A presaturation pulse is often applied above or below each slice to reduce signal from traversing veins. Moderate-to-large flip angles (30°−60°) are used to maximize contrast between stationary tissue and blood. Short TE values (< 7 msec) are preferred to minimize signal losses from phase dispersion. Maximal enhancement of flow occurs when the vessel is perpendicular to the plane of imaging. TOF techniques are thus somewhat insensitive to in-plane flow. Also, because of saturation effects, maximum slab thickness in 3D TOF MRA may be limited. Various modifications of the TOF technique have been developed to reduce in-plane saturation effects and improve visualization of smaller vessels. These include the use of magnetization transfer saturation pulses, overlapping of multiple slabs (MOTSA), fat suppression, and variable (ramped) flip angles. These methods are described in separate Q&A's. Although nearly all vendors use the generic terminology "time-of-flight", Philips calls their 2D-TOF and 3D-TOF sequences M2D Inflow and M3D Inflow, respectively. Philips also refers to 3D volumes as "chunks" rather than the more commonly used nomenclature of "slabs" or "sections".